For those of you who don’t already know, I have a crazy fear of spiders. Like, heart-stopping, run my car off the road, jump into the laps of total strangers, and stop traffic in the middle of a busy intersection kind of fear. 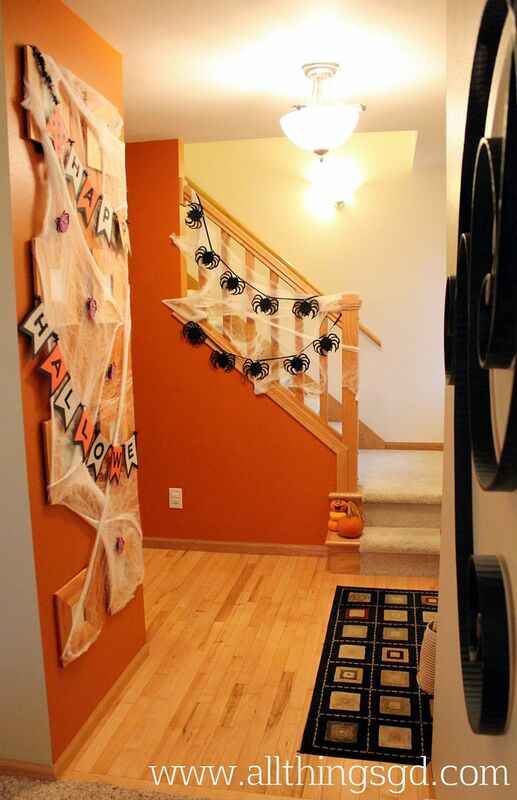 When it came time to decorate for Halloween (something I decided to do for the first time this year now that Kate is a little older and getting excited about holidays), I knew I wanted to put up some of that fun fake cobwebby stuff in our entryway. What I didn’t know if I could handle, however, were those little black plastic spiders that went along with it. I threw them in my cart to get them out of my hands and headed for the check-out. Three steps later I fished them out of my cart (careful to touch only the netting packaging; not actual appendages), threw them back in the seasonal section, and ran for my life. Decision made for real this time. I knew that even if I could make it through the check-out line and transport that bag of horrors home with me, every damn time I saw one of those blasted things out the corner of my eye I’d die a little death. And probably sprout a gray hair. And six wrinkles. What I needed were spiders that didn’t really look like spiders. Even more than that – what I needed were spiders that were kind of cute. The least scariest spiders ever imagined by anyone, ever, period. 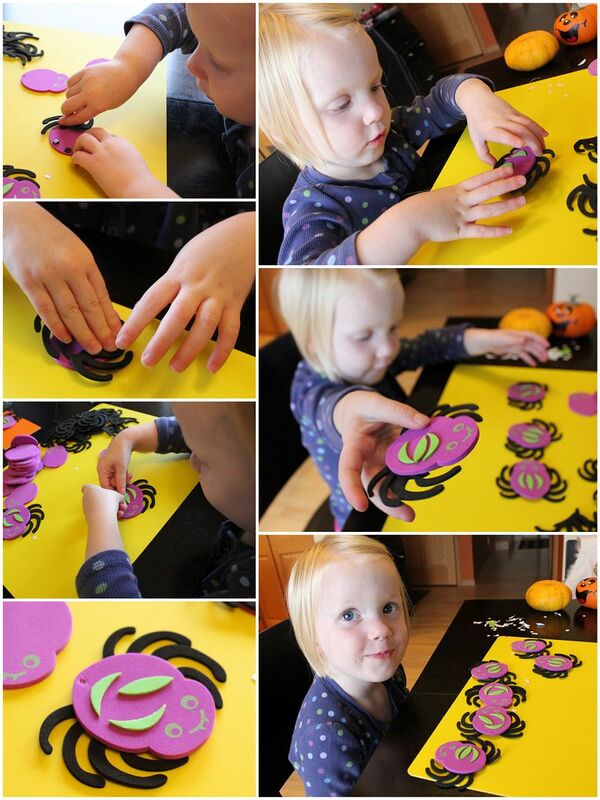 Kate (32 months), assembling foam spiders for our non-scary Halloween decorations. The view of our entryway from our front door. 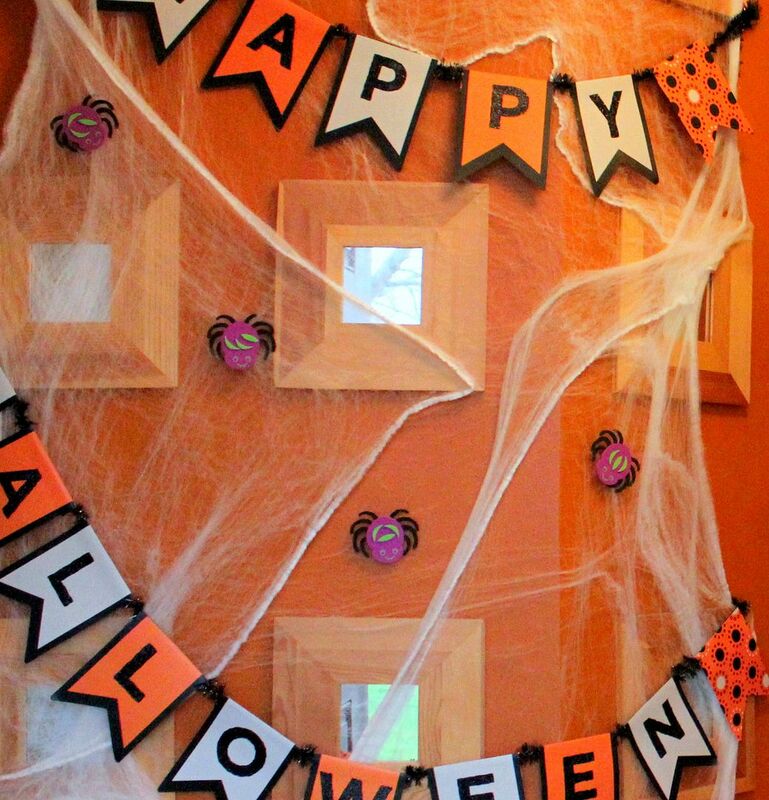 Come on in trick-or-treators – no scary spiders in this house! Close-up of Kate’s DIY foam (non-scary!) spiders. I can’t be the only one who’s on high alert this time of year! What are you hoping to avoid between now and November? 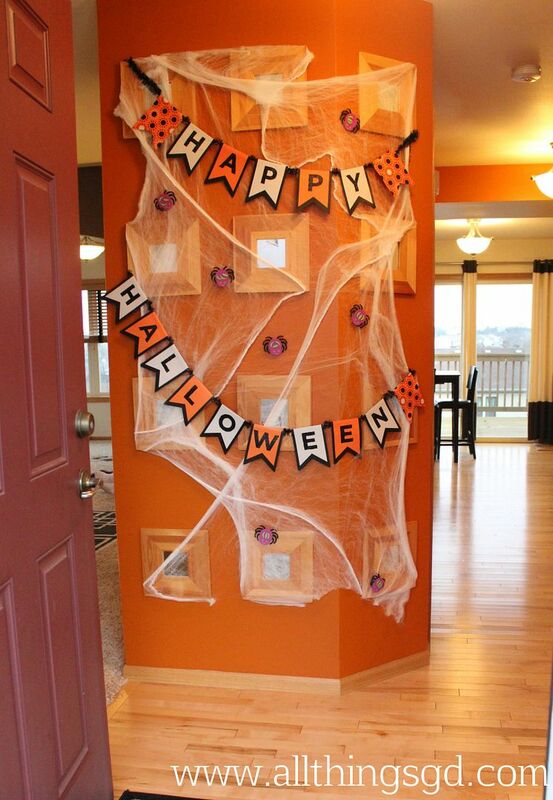 Cute decorations! I will file this away for next year. Your daughter is so adorable! 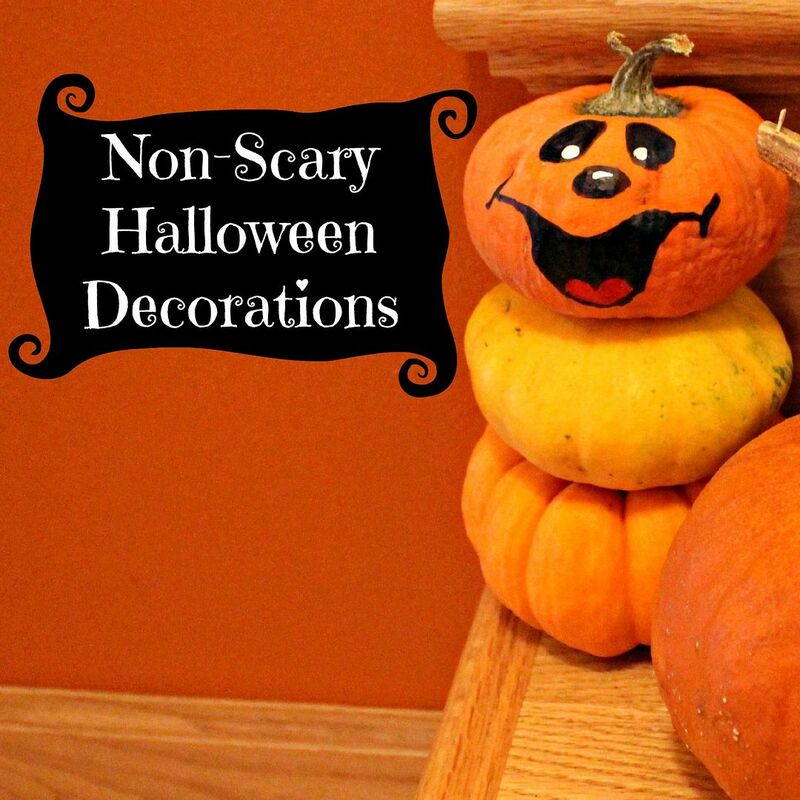 Cute decorations! I will be avoiding the TV, I swear everything on is scary!! I’m terrified of spiders as well. I have also run my car off of the road for a baby spider. And your glitter spiders are kinda freaking me out. 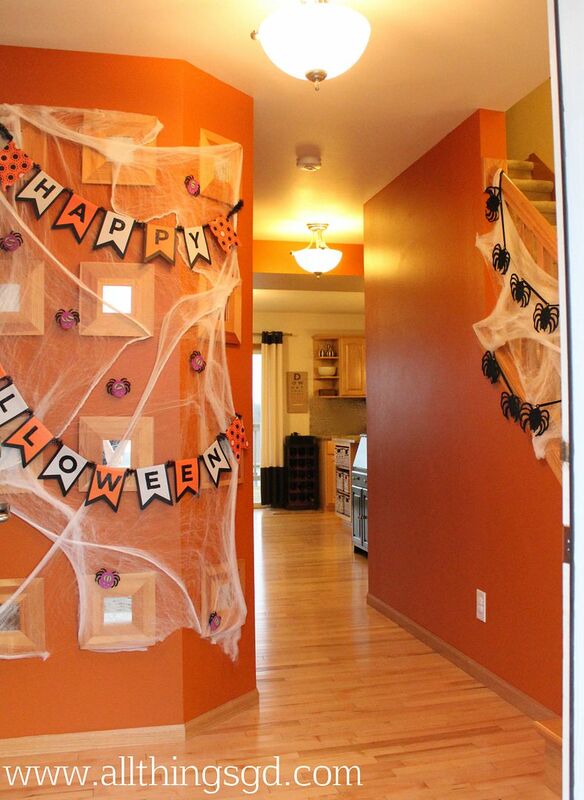 I don’t want to alarm you, but one year I was brave and put up fake spider web (sans spiders) for a party…. and a real giant spider moved in! Never again. I can’t wait for Halloween to be over and all the evil fake spiders to go away again! So cute! I too have a big fear of spiders! Where did you get the adorable Happy Halloween banner? Is Kate dressing up this year? The spiders you made are actually cute – not a word I would normally associate with spiders! Ugh, another crippling spider phobia here. To make it worse, when we were younger my brother told me that spiders always travel in pairs, so even if one of them is…escorted off the premises, then there is always another hiding in wait. Big brothers, huh? Those decorations are adorable! AHHHdorable! Kate is to die for! I HATE Halloween, seriously. I love the cute little kids in costumes and the candy but otherwise, no-thank-you. @Mrs.HVK: Agreed! I’m sure G will try to talk me into watching a scary movie (like he does every year) but I will resist (like I do every year). @E: Thanks! The banner is from Target. Kate refused to wear her costume last year so our plan is for her to wear it this year since it still fits. (It’s a ladybug costume.) If you ask Kate, though, she’ll tell you she’s going to be a puppy for Halloween, so apparently she has a different plan, hahaha. Guess we’ll see! @Chrissy: That’s horrible! Ew! I hope you’ve since shaken that belief. I am going to try to erase it from my memory so it doesn’t stick for me, too, lol. @Allison: I think your decorations look GORGEOUS! Well done, girl!